You are here: Home>Archive>Olney Rugby Union Football Club>Olney rugby team photographs from 1877 to date>Olney RFC 25th Anniversary 1972 Mini and Juniors Section 1997, Under 15/16's. Olney RFC 25th Anniversary 1972 Mini and Juniors Section 1997, Under 15/16's. 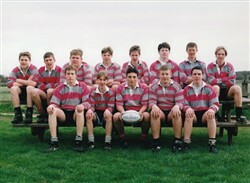 Olney RFC Mini and Juniors Section 1997, Under 15/16's. Olney RUFC coloured team photograph of the Under 15/16’s, 1996-97 players as part of the 25th Anniversary 1972-1997 of the Mini and Juniors Section. Names listed as: O. Wills, N. Collins, A. Haynes, S. Jarvis, A. Harrison, P. Tarrant, L. Gayton, C. Tigwell, M. Ayris, P. Powell, M. Turner, A. Williams. D. Dell (Captain).